The South Eastern Marches of The Lake District is the area enclosed by the A591 from Ambleside to wards Kendal to the North, the new National Park boundary to Morecambe Bay to the East, Morecambe Bay to the A590 at Greenodd to the South, and the A590 to Newby Bridge and then the east shore of Lake Winderemere to Ambleside. 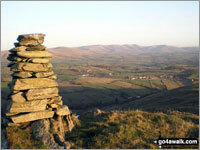 If you count only the Wainwrights there are tops to climb, bag & conquer and the highest point is . To see these Mountains, Peaks, Tops and Hills displayed in different ways - see the options in the left-hand column and towards the bottom of this page. To reverse the order select the link again. Is there a Mountain, Peak, Top or Hill missing from the above list? Let us know an we will add it to our database.